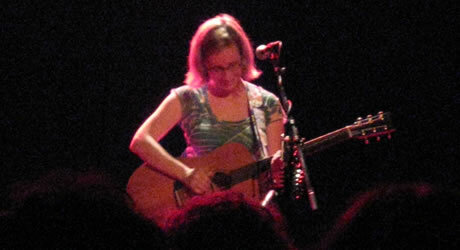 This blogger has been a big fan of the bespectacled, water-obsessed Laura Veirs ever since first discovering her infectious song “Galaxies” on the late lamented MP3 blog Salon Audiofile in 2005. Why it was not a huge hit, featured in iPod or car commercials and embedded in the denouements of The O.C. or Gray’s Anatomy, I’ll never understand. Still, she’s evidently doing well for herself, for I’ve now seen her live three times in New York City, and each time she’s graduated to a larger venue. This is the first time I’ve seen her perform solo, without her band The Saltbreakers (whom she lovingly refers to as The Bearded Men). Like seemingly every other singer/songwriter these days, she employs live looping technology (pioneered by Joseph Arthur and popularized by K.T. Tunstall) to become a one-woman band, accompanying herself with looped beats and bass lines all generated on a single acoustic guitar. 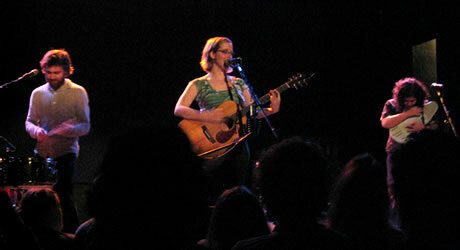 The mood was great and she was well-received, and she later ranked New York City as the best audience of the tour.